Figure 1. Morphology of the northeastern Caribbean region, viewed from the east. 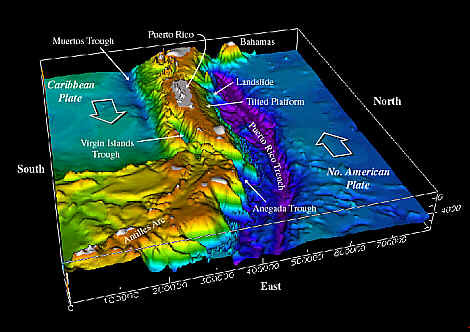 The plate boundary zone between the North American and Caribbean plates is delimited by the Puerto Rico trench to the north of the islands and the Anegada Trough and Muertos Trough to the south. Color shaded bathymetry prepared by USGS. Digital data courtesy of Troy Holcombe and Lisa Taylor, National Geophysical Data Center, Boulder CO, from International Bathymetric Chart of the Caribbean Sea and the Gulf of Mexico, sheet 1-09, published by Instituto Nacional de Estadística, Geografía e Informática, México, 1992. --DISCLAIMER-- This report is preliminary and has not been reviewed for conformity with U.S. Geological Survey editorial standards or with the North American Stratigraphic Code. The use of trade, product, or industry names in this report is for descriptive or location purposes only and does not constitute endorsement of products by the U.S. Government. Opinions and conclusions expressed herein do not necessarily represent those of the USGS.